The Rangely, CO W.E.Rock event started out with a drivers meeting at 9am followed by staging on the course for a 10am start. With thunderheads in the sky and a chance of rain it promised to be an interesting day with the mercury hovering around 30*C. The event takes place over 2 days with 4 stages each day for each car. Scoring is handled on a reverse scale, with the lowest score winning and points added for things like hitting cones, backing up, going out of bounds or rolling over. In each stage there is 4 gates (cones to go though and a 10 minute time limit set), going over the time or requiring the extraction truck to winch you upright gives you a total of +40 points. There is also bonus lines on each stage worth -10 points. With 29 total rigs over 5 classes it looks like we are in for an action packed weekend. The course is set along a sandstone ridge about 3km from downtown Rangely, with the wheeling happening directly above the camp. Day One was full of great action with some extremely difficult stages, great driving and even some crazy rollovers. At the end of the day sitting in first place in the Unlimited class with -99 points was Justin Keilman of Arizona in the 4wheel steer Fly-N-Hi buggy, followed closely behind by Todd Messer of Idaho X Rocks with -96 points and Jesse Haines of JHF Fab with -89 points. It’s a tight race and going to require some great driving to decide the winner. Pro-Modified class was sitting with Kevin Reimer in first with -68 points, Masa Tsuda all the way from Japan in second with – 47 points and Denis Volkov in third with 8 points. Sportsman A class had Tim Brown in first with -42 points, Chris Mercer in second with 1 point and Uriel Varela in third with 24 points. Day Two started out hot with not a cloud in the sky and trophies to be won in all the classes. With the course set up to be even harder than the first day it would require some great driving and awesome teamwork between driver and spotter to take home the win. The second day is slightly different because after the teams do their required 4 stages the top 3 or 4 trucks (depending on how many were competing in the class) would be put into the shootout at the end of the day to decide the winner. The shootout has the same 4 sets of gates but is a slightly easier course showcasing some great driving as the top drivers fly around the rocks to set the podium positions. With some of the top drivers from day one struggling on the course on the second day the leader board kept changing as the day progressed. By the time the dust settled at the end of the days 4 stages Justin Hall had climbed all the way from 7th place and into first place for the shootout with some amazing driving and great team work this his dad and spotter Mark Hall. Another huge surprise was young Olivia Messer in second place with some fantastic driving and even coming out way ahead of her Dad, owner of Trail Gear and title sponsor of W.E. Rock, Mark Messer. 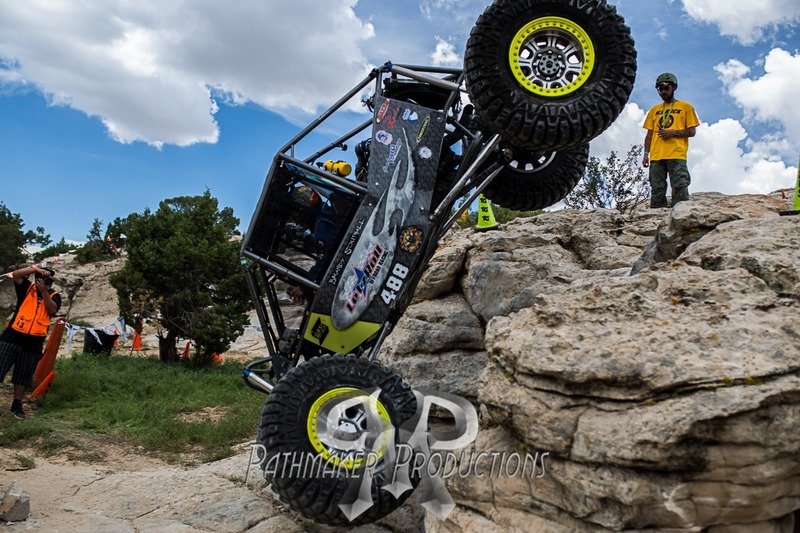 Sitting in third place for the shootout was rock crawling legend Jesse Haines. Due to the size of the Unlimited class they also added the fourth place driver to the shootout, Todd Young. As the wind picked up and the dust started to fly the Shootout got underway. Jesse Haines had some bad luck trying for a difficult bonus gate and ended up rolling onto his roof and ending his chance at the podium. Justin Hall, Olivia Messer and Todd Young had almost flawless runs during the Shootout and placed First, Second and Third respectively. Next up was the Pro Modified Shootout with Kevin Reimer staying on top for the win followed closely by Masa Tsuda and then Denis Volkov in third place. Don’t forget to Subscribe to my YouTube channel. Don’t miss out on any of my rock crawling, wrenching or general automotive stupidity. New videos every Saturday, plus bonus vids once I get some more time out in the woods this season! Check it out for all your Nissan WD21, R50, R50F, R51 Decals and more!